I'm sharing my own personal derivative of the pyboard, the IsoCore. I designed it primarily for my own personal ecosystem and learning/experimentation. It drops the accelerometer, but adds a card-edge PCIeX1 connector. I chose - and abused - the PCIeX1 as I believe it's likely going to be available for a long while relative to the scale of a home-lab ecosystem. It runs the stock 1.9.4 pyboard image provided you bridge PA9 to VUSB with a 560R for USB use. (This could also be done off-board). I developed it using CircuitStudio [Altium's lighter offering]. Everything is available on BitBucket. How much to get one made at MacroFab? 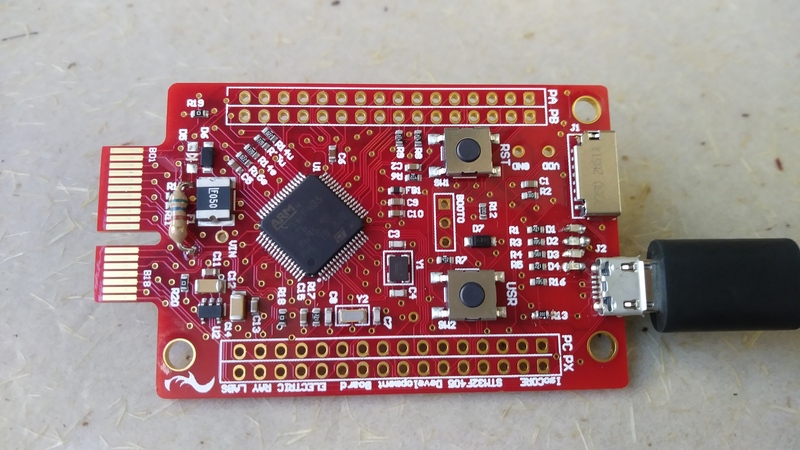 From MacroFab it looks like about $72/board turnkey - they do the PCBs and bring in the components. It drops off quickly if you order a few - I did QTY 4.
would be interested to know what it worked out to per board for the 4 that you had made ? How do you access the PCIeX1 interface from Python? I don't think it is actually PCIex compatible, I think he is just using the connector format for expansion ?! @devnull is correct - I'm just using the connector for my own expansion not in a compliant form. This is not a decision I would make on a board I intended for widespread use outside my home lab. I like the supply chain prospects of the connector in the long term - hence standardizing on it for myself. I can get straight, right angle, I can expand it if I need more I/O later and stay with in the PCIeXx family, I can take a desoldering iron to any pile of surplus computer guts if I got really desperate, or I suppose, even cut and jump a motherboard if I really just wanted Hack-a-day credit. One thing I'm playing with is figuring out what I want on an interface. I can emulate others I've seen, but through experience at home I'll get a better feel for what really is useful, what limitations (current draws, pinouts, interference/emc...) I'll run into, and what are the real limits of the different protocols and signals as I abuse them over ribbon cable/jumpers/or the like. I've generally found that while I often am tempted to read and plan things to death, experimentation is often the best teacher - especially when the stakes are low. @WhiteHare / devnull: To clarify on the price, $72 ea is at Qty 4; in single quantity I think it was closer to $100. For most builds I generally want at least 3 on my first order.